I had every intention of doing a pre-Jamaica and a post-Jamaica blog, but time seemed to slip away from me so here is everything in one. This past week was my Spring Break. 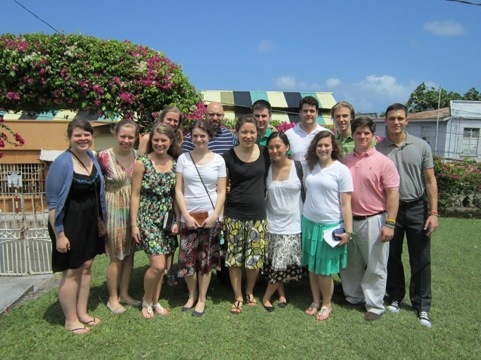 I left last Saturday with a group of 13 others to spend the week in Jamaica doing mission work. The week was absolutely amazing; the scenery was beautiful and the presence of the Spirit was constantly felt. We arrived late Saturday in Montego Bay, JA and after an hour bus ride arrived at the villas we were staying at in St Anne’s Bay. Sunday morning we got up pretty early, some more so than others as we weren’t exactly sure what the local time was. We attended the 9:15 worship service at the local Baptist Church (yes, there was a local Methodist Church, but let’s not go there); this was an interesting experience in of itself as these were not baptists like you would think of in our part of the world. The service was done in my favorite high-church style, there was a processional, and the pastor, who serves on a circuit, was female! After church we returned to the villas for lunch and spent the rest of the day observing a true Sabbath; my nap that afternoon was quite possible one of the best I’d ever had. Monday we began work on the house we were building in the local community. The house was only a 10′ x 14′ room with a few windows and a door up on blocks. 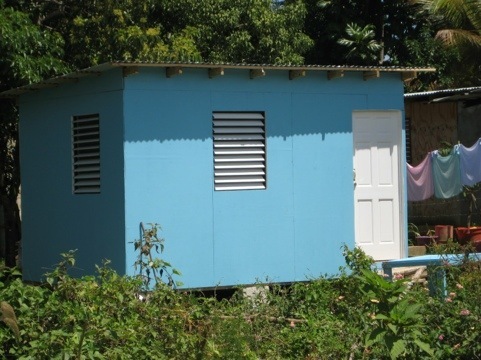 We would call this a shed here at home, but in Jamaica this is a home for a family of four. It took me a couple of days to see, regardless of the size of the house, just how much of a blessing it was for this family. With 14 of us working we finished the house on Tuesday afternoon. Wednesday we moved to the local community center to do some repainting, which we finished up Thursday morning. We spent Wednesday and Thursday afternoons in a local field interacting and playing with lots of the kids from the community. Thursday afternoon, we also visited a local infirmary. Thursday concluded our work week. Friday was our free day where we went snorkeling and visited the local straw market and shops that morning and in the afternoon went to Dunn’s River Falls. Saturday we woke up early and headed for the airport to make the trip back home. I was really glad that I decided to go on the trip. The Wesley had decided in the summer that our new associate director would be leading a Spring Break mission trip to Jamaica. At first I had decided that I wasn’t going to go with it being so close to General Conference. I thought I would be extremely busy with school work and preparing for Tampa, but during finals week at the end of last semester, I really felt called to go. It was amazing to see the support for the trip come in without worries and how during the trip I could see God working. This was definitely not my first mission trip, but it was my first one out of the US, and that is where I think the significance of the trip falls for me. In five short weeks I will gather in Tampa with my fellow United Methodists. Together we will make decisions and vote on legislation that impacts the entire denomination. The theme of the conference and the phrase we will repeat over and over again is, “The mission of The United Methodist Church is to make disciples of Jesus Christ for the transformation of the world.” I think over this last week I was finally able to see a glimpse of what this mission statement truly means. The world is bigger than the communities we live in. There are still places of the world the Christian Witness (and definitely the United Methodist Witness) have yet to reach. This is what the mission means. I think now every time I hear or say that phrase images of this week, of Jamaica, will come to mind, and the importance of the work I do in Tampa and after GC will become so much more tangible and important.